As a work-resident of Greenpoint, I feel lucky that I can reap the benefits of the neighborhood without having to pay the increasingly steep average rent. My existence up here is dependent on a fair amount of lying to myself– that I can afford to eat at the nice restaurants here (false), that the nice people who work in the hip boutiques actually believe I’m going to buy something this time around (so false). But what really charms me about the neighborhood are its eccentricities– the picture window on Franklin decorated neatly with dozens of bobble heads gyrating in unison, the Polish bars where you can bet there’s a strange scene going down or at the very least some $1 Jell-o shots to pick at, and of course the ancient bag lady who shuffles along Manhattan Avenue screeching in a mix of gibberish and maybe Old Church Slavonic, sometimes disappearing down into the subway or inside an apartment, knowing that she can safely leave her bags and carts anywhere she pleases. This is the Greenpoint of Behind the Wall, a short film directed by Bat-Sheva Guez, who lived here for close to a decade before moving to South Brooklyn. “I really love the history of Greenpoint, I love the little idiosyncrasies– if you’re walking slow, you can see the guy who has the old telephone booth from Britain in his backyard, and there was somebody who had a giant sailboat in their living room, there are just weird things,” she recalled. “If you walk and take your time and peek around corners, look in backyards, you’ll always be surprised by something.” Heck, you might even get a look into Billy Leroy’s house. The 17-minute short– for which Guez won the Art of Brooklyn Film Festival’s award for Best Director on Monday– is a magical-realist mystery tale of sorts, one that mourns a changing neighborhood in unexpected and incredibly imaginative ways. Really, it’s rare that artwork about gentrification goes beyond simply acknowledging that the problem exists and damning the powerful actors who are responsible for the phenomenon by which Brooklyn neighborhoods (and places all over the world) are becoming sanitized, whitewashed, and marketable versions of their former selves. Lately, we’ve seen a few projects that have encouraged a more nuanced look at the people whose lives are being negatively impacted by the shifting scenery, and Guez’s short film is no exception. The film centers on the story of Katrin (Alexandra Turshen), a dancer whose career has been cut short by a leg injury. We find her lugging a heavy boot around a new apartment in Greenpoint, in a building full of strangers and an unfamiliar neighborhood. While writing the script, Guez’s ballet teacher suffered a similar issue. “The percussion of the boot, and having someone who’s so light– almost like air these dancers– to be like a bird, sort of grounded with the heaviness of this boot, that was the visual and aural inspiration,” she explained. While attempting to find the source of the noise, Katrine peers through a mouse hole and discovers a charming old couple dancing in the apartment next door. But when she tries to track them down during daylight hours, she discovers that the building has some hidden, impossible architecture– either that or she’s encountered a couple of ghosts. Thanks to the film’s fantastical elements, Guez resists hitting you over the head with the theme of gentrification. 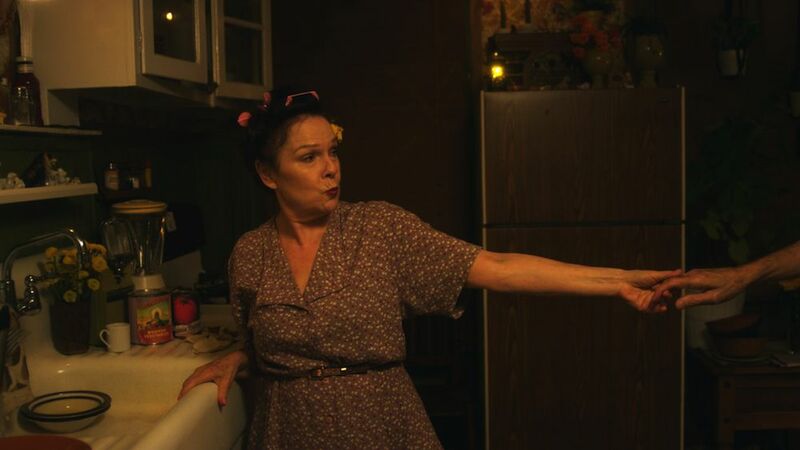 And yet, the presence of the elderly people in the film and the ways in which Katrin interacts with them can hardly be removed from how Greenpoint is on a fast-track to turning into Williamsburg (even the feral cats are getting kicked out) at the stroke of midnight. This might also be owed to the fact that Guez has drawn on her own experiences with Greenpoint’s olds. “Behind the Wall” will screen Thursday, July 14, 7 pm at the Triskelion Arts Dance Film Festival, Muriel Schulman Theater, 106 Calyer Street, Greenpoint.